Over 11,000 new vehicles were wrapped with Suntek in New Zealand in 2016. Suntek wraps are superior to any other film available in New Zealand. Suntek offers a breakthrough technology for paint protection applications. Iconic Car Care is the only applicator of Suntek in Ashburton. Note: Brand new vehicles do not require paint correction. Used vehicles may need 1 - 3 stages of paint correction to ensure the optically clear film doesn't go over a scratched surface. Tip: Another option for protection worth considering is the ceramic coating protection. You could use Protection Film over high - medium risk areas (bumper, bonnet, mirrors etc) and the Ceramic Coatings over low - no risk (rear bumper, roof, rear fenders, etc) for a fully protected vehicle. Which vehicles should get wrapped? Any vehicle/machine will benefit from having the paint preserved and protected. 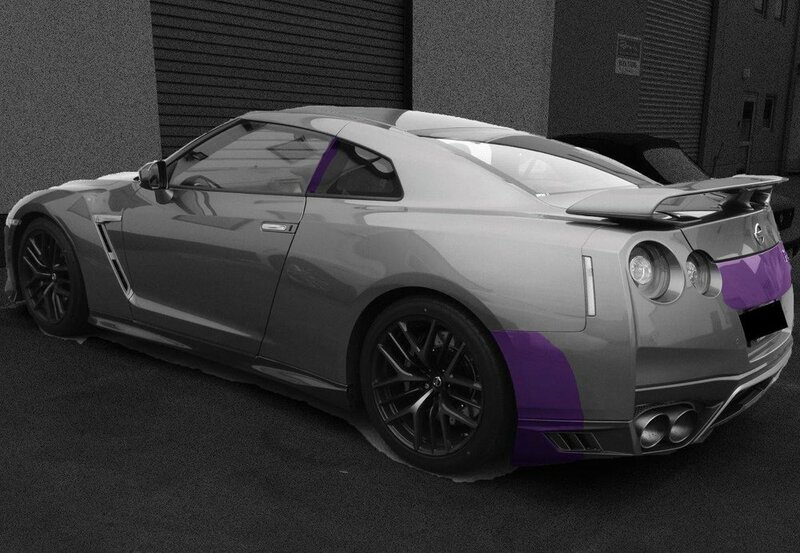 One of the fastest legal stock cars on the road is the Godzilla. To ensure we preserve its aesthetic looks and value, we have covered 60% of it with Paint Protection Film to the medium - high damage impact areas and 40% in Ceramic Coating to the low - no damage impact areas. Work we completed before applying the film: 1 Stage Paint Correction, IGL Quartz+ Ceramic Coating on the paintwork, Ceramic Coating on the wheels, Ceramic Coating on the trims, Ceramic Coatings on the headlights. Paint Protection Film: Ultimate Road Protection + A Pillars, roof edge, full doors, rocker panels, splash & trunk edge. 1000kms on the clock could be called brand new. We meticulously touched up the stone-chips and leveled them to an invisible repair. It is said that the aesthetics of a car makes up 30% of its value. In this case, protecting the full vehicle is the only viable option for such a beautiful beast. Work we did before applying the film: 2 Stages of Paint Correction, detailed Paint touch up, Ceramic Coating on the wheels, Ceramic Coating on the trims, Ceramic Coatings on the headlights. Paint Protection Film: Full-cover - bumper to bumper. Brand spanking new. This technologically advanced Q7 is an expensive car, therefore it was very important to have it protected before it would hit the road. Paint Protection Film: Ultimate Road Protection + A & B pillars, rocker panels, bottom of doors, handles, door edges, splash & trunk edge. A superb example of German engineering, this AMG is a real looker with its gloss black accent & red calipers. This is a very, very fast car. Even though it is not brand new it is important to protect this car protecting it from outside elements. Work we did before applying the film: 3 Stages of Paint Correction, IGL Quartz + Ceramic Coating on the paintwork, Ceramic Coating on the wheels & Ceramic Coating on the trims. Paint Protection Film: Ultimate road protection, A & B pillars, rocker panels, bottom of doors, handles, door edges, splash & trunk edge. The popular D-Max is a tough work horse that is very popular in NZ. This particular D-Max does 50,000 - 60,000 km a year through paddocks, rivers, bushes and forests. It's a loyal companion, but, without protection, its paintwork won't stay in top shape for long. Intensive work had to be done to bring it back to it's original, new condition. Work we did before applying the film: 1 Stage of Wet Sanding, 3 Stages Paint Correction, IGL Quartz + Ceramic Coating on the paintwork, Ceramic Coating on the wheels, Ceramic Coating on the headlights and Ceramic Coatings on the trims. Paint Protection Film: Ultimate Road Protection, A & B pillars, rocker panels, bottom of doors, handles, door edges, splash & full trunk door. Purchased a brand new vehicle OR own a used vehicle that you would like protected? Come see us at 140 Dobson Street, Ashburton for your free quote.